Ephraim Eddy FRENCH. [Sketch furnished by a friend.] -- The progenitor of the FRENCH family in America was John FRENCH, born in 1612, who came from Thorndic, Scotland, to the Massachusetts colony, when about twenty years of age, and in 1639 was admitted as a freeman in Dorchester. He removed to Braintree in 1648, and from him have descended most of the name in New England. They are generally people of marked individuality. Samuel FRENCH, a native of Salisbury, Mass., born January 29, 1789, married Lydia SAMPSON, born at Woodstock, Vt., December 2, 1779. Samuel emigrated to Vermont when a boy, with a Mr. BAKER, and engaged in felling trees, clearing land, and other pioneer work. After his marriage he located on a wild lot in Washington, and in time his labors were successful in making a comfortable home for himself and wife and their four sons and three daughters, -- Deborah, married John PAINE; Lucy (deceased), married Alfred BROWNING; Leander (deceased); Ephraim E.; Lydia (deceased); Philona (deceased), married Addison RIPLEY; Samuel, Jr., died young. Mr. FRENCH was a hard working farmer, and a good and useful citizen. He died in 1850. Ephraim Eddy FRENCH, of Barre, son of Samuel and Lydia (SAMPSON) FRENCH, was born in Washington, Orange county, Vt., January 31, 1814. Ephraim had but the educational advantages of the common schools of Barre, where his parents had removed when he was four years old. His surroundings-those of a farmer boy of three-quarters of a century ago could not restrain or limit his desire for a broader culture, and while at work in the fields his book was his companion; every leisure moment was given to study, and he fitted himself for a teacher, which avocation he pursued successfully for six winters in Barre and vicinity. He continued tilling the soil, however, until he was twenty-three, when, his health being much impaired, he was forced to relinquish this occupation. In the spring of 1838 he commenced the study of law with Newell KINSMAN, Esq., in Barre, and, after one year under his tuition, was taken into partnership by Mr. KINSMAN, and at the September term of the County Court, 1841, Mr. FRENCH was admitted to the bar, and in 1844 as a practitioner in the Supreme Court. He continued as a law partner with Mr. KINSMAN five years, then opened an office for himself, and soon had a lame and lucrative business, mostly in Orange and Washington counties. His close application to his chosen field of labor seriously injured his health, and his physician advised him to engage in a more active business, and stop studying so much; and in 1848 he engaged in merchandising in Plainfield with his brother-in-law, Clinton FRENCH (firm name French & Co.), where he remained two years. Returning to Barre in 1850, he bought out two firms, George W. KEITH and Orvis FRENCH, and united the stocks, making the largest mercantile establishment in Barre. This was conducted in a building located on the site which the new Granite Savings Bank building now occupies; here Mr. FRENCH was in trade for two years. He then reopened his law office, continuing in active practice until 1875, when he sold his law library and legal business to G. L. STOWE. Mr. FRENCH married, August 5, 1845, Angelic, daughter of David and Delia (FRENCH) FRENCH, of Barre. She is a lineal descendant of John, of Dorchester, the line being John(1), Thomas(2), Abidjan(3), David(4), David(5), Angelic(6). Her father was born in Westmoreland, N. H., February 16, 1794, and removed to Barre in 1810, where he engaged in tanning. He died in 1864, at the age of seventy years. Her mother was born in Barre, December 2, 1794, and was a daughter of Bartholomew and Susannah (GALE) FRENCH. Bartholomew was one of the first settlers of Barre. He was born in Bridgewater, Mass., October 18, 1752. His wife, Susannah G. FRENCH, was born in Sutton, Mass., July 14, 1758. The children of David and Delia (FRENCH) FRENCH were Christina (deceased), married A. N. JACKMAN; Fidelia, died young; Angelic; Orvis; David C. (deceased); Clinton; Esther A., married Nathaniel CHAMBERLIN; David E.; Gilbert L.; Delia A.; Alice, died young. Mrs. FRENCH is an estimable lady of education and refinement, social and kind, a genial companion, and has been a worthy helpmate of her husband. Mr. FRENCH was a pronounced Union Democrat, and warmly supported the Union in her time of trial. He was appointed postmaster of Barre, February 24, 1857, under President Franklin Pierce, held the office under Buchanan, and two years under Lincoln, resigning then in favor of his deputy. He was often delegate to county, state, and congressional conventions. As he was a Democrat he was in the minority party, but was its standard bearer in many elections. He was one of Barre's most active and influential citizens, and one of the principal movers, forces, and promoters of her progress. 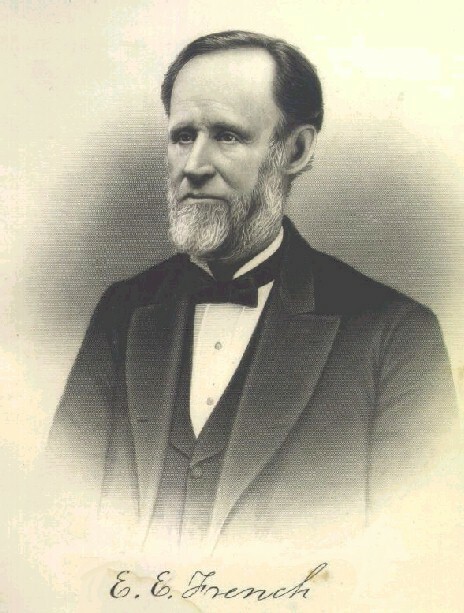 In 1873 he was prominently connected with Dr. BRALEY in the removal of the Orange County bank from Chelsea to Barre, and on its organization as the National Bank of Barre he was placed on the first board of directors, and was its vice-president until the death of Dr. BRALEY. He was one of the organizers and incorporators of the Granite Savings Bank and Trust Company. He was one of the trustees and chairman of the prudential committee of Barre Academy for over twenty years, and until he deemed it his duty to resign in favor of younger men. Mr. FRENCH was one of the first to call the attention of the public to the desirability of constructing the Montpelier & White River railroad, was one of the original incorporators, and was elected chairman of the town commission to bond the town, and to contract with the Central Vermont Railroad Company to build the road. He was the main speaker in securing the bonding for the railroad not only of Barre, but of Williamstown and Brookfield. To him more than to any other are the people indebted for the building of the "Barre Branch." July 5, 1875, when 6,000 people assembled to celebrate the opening of the road, Mr. FRENCH welcomed them with a graceful and appropriate speech, expressing his gratification that this important object for which he had so zealously labored had been consummated. A committee of three was chosen -- Mr. FRENCH, Josiah WOOD, and Dr. BRALEY -- to arrange with Gov. SMITH for an appropriate depot. This was done only by each of the committee giving largely of their private funds. He was a director of the road from the first, and its president for the last six years of his life. He was an attendant of the Methodist church and a liberal supporter of its charities. As a lawyer, Mr. FRENCH was a hard worker and close student, earnest and industrious in the preparation and trial of causes, and stood high among his brethren. Devoted to the interests of his clients, he was persistent in securing their rights, and ever a safe and honest counselor. He had many important cases entrusted to him, and was financially successful. As a citizen, Mr. FRENCH was active, positive, and public spirited; he took a lively interest in the prosperity of the community, and enjoyed the strong friendship of the leading men of the state. While on his way home from a trip to California he was taken sick at Denver, Col., and died at the residence of his brother, at Evanston, Ill., April 25, 1888. Whitman George FERRIN, of Montpelier, son of John and Hannah (JACOBS) FERRIN, was born at Croydon, N: H., July 13, 1818. In 1819 his parents moved to Morristown. He read law with L. P. POLAND, in Morristown, and was admitted to the Lamoille County bar, June term, 1843. He went at once into practice at Wolcott and was there five years, then in Johnson seven years, and in Hyde Park about three years. He came to Montpelier in 1859 and has resided here since, being in active practice for about ten years, when he was elected state auditor, which position he held till 1876. He was state's attorney of Lamoille county and represented Montpelier two years. He was some years treasurer of Montpelier Savings bank and is yet on its board of management, and is president of the Union Mutual Fire Insurance Company. He married, December 25, 1843, Harriet Matilda HARRIS, of Stowe, and their four living children are Alma T., wife of William P. RICHARDSON, of New York city; Albert W., the present treasurer of the Montpelier Savings bank; Charles H., a Montpelier merchant; and Hattie M., wife of Dr. Homer W. BRIGHAM, of Grand Rapids, Mich.
Lewis CHAMBERLAIN, of Plainfield, was admitted November term, 1843. He at once began practice in Plainfield and remained there till his death, in August, 1863. He was in 1855 and 1856 elected assistant Judge of the County Court. Edward Carleton JOHNSON, of Montpelier, son of David and Lucy (TOWNE) JOHNSON, was born at Newbury, September 30, 1816, graduated at Dartmouth 1840, read law with L. B. PECK from 1841 to April 25, 1843, when he was undoubtedly admitted to the bar in this county, but as it was in the day of Mr. CHURCHILL's clerkship it did not happen to get recorded. He formed a partnership with Lucas M. MILLER and began practice in Montpelier. He removed to New York city in 1845 and went into mercantile pursuits, and has been trustee of several estates that required business management. He married Delia Maria SMITH, of Hamilton, N. Y., August 31, 1847. John DEAN, JR., of Waterbury, was admitted to the bar of the Supreme Court, March term, 1844, and was in practice there from that year till 1847, when he came to Montpelier, but did not remain more than one year. Monroe L. BURNHAM was admitted at April term, 1844. Samuel HOYT, of Middlesex, was admitted April term, 1844. He came to Montpelier in 1840 as a manufacturer, and went to North Montpelier, where he was unsuccessful in his business enterprise; he read some and got admitted as above. He went to Middlesex and practiced there two or three years, the rival of McIntyre. They put many legal grists into the hopper. Mr. HOYT went to New Orleans and is dead. Hiram C. MCINTYRE, of Middlesex, was admitted April term, 1844, and practiced for about six years in Middlesex. He staid longer than HOYT and was afterwards in Lamoille county. He died in Middlesex. Guy C. SAMPSON, of Montpelier, opened an office in 1844 and was admitted to the bar of the Supreme Court, March term, 1845. He left Montpelier that year. John Melvin GILMAN, of Calais, only brother of Marcus Davis GILMAN who died last January in Montpelier, and son of Dr. John Taylor GILMAN and his wife, Ruth, daughter of Col. Caleb CURTIS, was born in Calais, September 7, 1824. His father died the next February; and his mother married Nathaniel EATON, their sons, Caleb Curtis EATON, of Montpelier, and Dornjan B. EATON, the New York lawyer of civil service reform fame, being half-brothers of John M. and Marcus D. GILMAN. John M. read law with HEATON & REED, and was admitted November term, 1845. He went into practice in New Lisbon, Ohio, and in 1857 moved to St. Paul; where he is now a prominent lawyer. He married Anna G. CORNSWALL, of New Lisbon, June 25, 1857. See Hemenway, vol. 4, p. 151, for full sketch. James Reed SPAULDING, son of Dr. James and Eliza (REED) SPAULDING, was born in Montpelier about 1822. He graduated at the U. V. M. in 1840, and began the practice of law in Montpelier in 1845 and pursued that profession here for a few years, being admitted to the Supreme Court bar, April term, 1847. He left the law for journalism, went to New York, helped found the World, but left it for the Times, on which, while Mr. Raymond was its chief, he did excellent editorial work. He died at Dover, N. H., of apoplectic paralysis, in October, 1872, in his fiftieth year. Clark W. UPTON, of Barre, began practice there in 1846 and remained five years. He went West, where he succeeded. He has been mayor of Waukegan, Ill.
Jared S. DEMMON, of Waterbury, began practice there in 1847 and continued four or five years at least, when he went West. He was admitted to the Supreme Court bar, April term, 1851. He died at Minneapolis, Minn.
Dan S. DEMMON, of Waterbury, brother of J. S., was admitted September term, 1855. It is said he could write with both hands at the same time -- an enviable gift! He went West and died at Minneapolis, Minn.
Henry WALBRIDGE is In the Register as an attorney in Plainfield in 1847. George D. RICE, of Waitsfield, was in practice there in 1847. He went to Wisconsin or Michigan and became very successful. Henry M. RICE, sometime U. S. Senator from Minnesota, was of the Waitsfield family as was Edmund RICE, M. C. from the St. Paul district in the fiftieth Congress. I have been told George D. became a member of Congress, but aside from the habit the Mad River Valley boys have -- Matt CARPENTER from Moretown and Roswell G. HORR from Waitsfield, for example -- of becoming senators and representatives I have found no proof of that. Chauncey SMITH, of Boston, one of the leading patent lawyers of the country, is a native of Waitsfield, a son of Ithamar and Ruth (BARNARD) SMITH. "Mr. CARPENTER's birthplace and the home of his youthful days was only a dozen miles from the town of my own nativity, the hills of which I can still see from my present home, and we first met when we were both very young and studying law, at a small school-house situated in the very heart of the mountains, to contend through the whole day and night for the rights of our respective clients in a very small affair, before a farmer justice of the peace and a jury of six"; also Senator Edmunds said: "In an acquaintance of more than thirty years and an intimacy of nearly fifteen we never had an unfriendly feeling or dispute, and I never received from him a ward hurtful or unkind. His few human faults I forget, as I would wish my own to be forgotten. Peace to his great soul." Cornelius N. CARPENTER, of Northfield, son of Harvey W, and Jane (CAMPBELL) CARPENTER, was born in Moretown in 1826. His mother was drowned in the great freshet of July 27, 1830, and his father lived in Northfield from 1836 till his death in 1849. 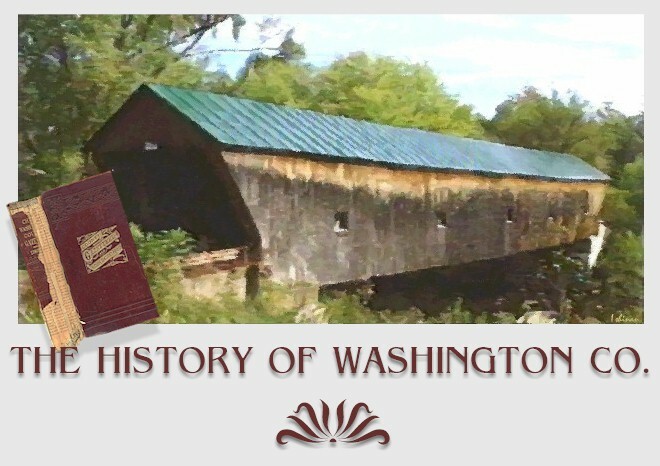 Cornelius was admitted to the Washington County bar, November term, 1848. He practiced in Northfield a few years, went West, returned, and was captain of Co. C, 15th Vt. Vols. He is now president of a bank in Broadhead, Wis.
H.M. SAFFORD was admitted to the bar of the Supreme Court, April term, 1848. Francis Voltaire RANDALL, son of Gurdon and Laura S. (WARNER) RANDALL, was born in Braintree, February 13, 1824. He read law with H. CARPENTER and was admitted November term, 1848. He practiced in Northfield till 1857, being postmaster from 1853 to 1857, when he removed to Roxbury. In 1860 he moved to Montpelier. In May, 1861, he was captain of Co. F, 2d Vt., and was in its battles till July, 1862. He was colonel of the 13th Vt. Vols., and at Gettysburg led them to victory. He was afterwards colonel of the 17th Vt. He returned to Montpelier, had a large practice, and in 1876 moved to a farm in Brookfield, from which he practiced law, and lectured, principally on the battle of Gettysburg. In 1884 he returned to Northfield. He died March 1, 1885, of apoplexy. I remember well how popular Col. RANDALL was in the 2d Brigade. He was a bluff, brave soldier; and he was a lawyer of rude, effective strength, but ever courteous to his younger brethren. His second wife, Olive COLBY, to whom he was married September 6, 1863, survives him. Francis V. was the only child of his first marriage surviving him. The children of the second marriage were Phil Sheridan, (born in 1865, graduated at Norwich University 1886,) Gurdon Colby, and Luther Volney. See Hemenway, vol. 4, p. 16, and Childs Orange County Gazetteer, p. 83, for more full account. Col. RANDALL's life during the war was so full of incident that it is utterly useless here to attempt details. Luther HENRY, of Waterbury, son of Sylvester and Sibyl (PROCTOR) HENRY, was born August 14, 1826, read law with P. DILLINGHAM, and was admitted in May, 1849. He began practice in Waterbury, and there continued to live till his death, January 1, 1867. His first wife was Flora TAPLIN; his second, Katherine E. ROYCE. Oscar F. SILVER, of Montpelier, was a student in the U. V. M. in 1842. He read law, and was practicing in Montpelier in 1849, and April term, 1850, was admitted to the bar of the Supreme Court. He is now living in Berlin, Wis.
David B. FAY, of Calais, appears as a practicing attorney of that place in 1849, and so remained ten years except one year (1853) when he was given, as of Plainfield. Mr. FAY still lives in Calais, and having a good Vermont farm has cultivated that instead of the law. Milan H. SESSIONS, of Waitsfield, born in Randolph, December 4, 1821, admitted at Chelsea, June 17, 1846, practiced in Waitsfield from January, 1850, to May, 1855, and was state's attorney in 1851 and 1852. "Long. Sessions" his brethren called him. He moved to Waupaca, Wis., served as captain in the 21st Wis. Vols., moved to Nebraska in 1871, and was speaker of the House fifteen years ago. In 1884 he moved to Minneapolis, where he now resides. He married, November 3, 1847, Caroline C., daughter of William B. CHANDLER. John Gile SHERBURNE, of Waterbury, son of John SHERBURNE, was born at Northwood, N. H., December 20, 1820, graduated at Dartmouth in 1842, came to Vermont as assistant in the surveys for the Central railroad, read law and was admitted November term, 1850, and practiced at Waterbury till, he went West with one of the Demmons about 1856. He married Thirza FLAGG, daughter of Jesse BRIDGMAN, of Hanover, N. H., in 1843. Alpha Child MAY, of Northfield, son of Elisha and Elethea (WOODWARD) MAY, was born at West Fairlee, May 16, 1825, graduated at Dartmouth 1847, read law with O. H. SMITH and F. F. MERRILL, and was admitted November term, 1850. He began practice in Northfield, in December, 1850, and moved to Milwaukee, Wis., November 10, 1852, where he still resides. He married Eliza S. REED (twin sister of Mrs. Charles W. WILLARD), of Montpelier, March 22, 1853. William A. DODGE, of Barre, son of Nathaniel DODGE, was educated at the U. V. M., read law, and was admitted November term, 1850. He practiced in Barre till 1854, when he moved away. Luther Leland DURANT, son of Luther and Susan (LELAND) DURANT, was born in Springfield, May 30, 1827, crept into the fire when a child and crippled his right hand, read law with B. H. ADAMS, was admitted November term, 1850, and was with C. W. UPTON at Barre for a time, I think both before and after admission. He began practice in Waitsfield, in June, 1852, and in November, 1855, went to Waterbury and became a partner of Paul DILLINGHAM. In 1867 he moved to Montpelier and became a member of the firm of RANDALL & DURANT; they did a very great business for some years succeeding the war. Mr. DURANT suffered partial paralysis, but continued to practice after the firm dissolved. Their daughter, Lettie Estella DURANT, was born in Waitsfield, June 26, 1854. I appointed her assistant in the state library during the session of 1874; she attended the U. V. M., one of its earliest girl students; she was appointed assistant in the Fletcher library in 1876; returned to the state library during the session of 1876, and in 1877 or 1878 married Augustus TORREY, of Burlington. She died June 20, 1879, leaving an infant child. She was a lovely girl and an accomplished woman. Her brother, Paul Dillingham DURANT, was born February 2, 1874, and was page in the executive department last session. Between the two where God has not." Norman DURANT, older brother of Luther L., may have been admitted here during CHURCHILL's administration of the records; he practiced at Tunbridge from I844 to 1850, went to California, and was not heard of more. Langdon C. WHEELOCK, of Barre, was admitted November term, 1850, and practiced at Barre some twenty-five years, and died there. He was a thrifty practitioner. George Washington COTTRILL, son of Mahlon and Catherine Smith (COUCH) COTTRILL, was born in Montpelier, May 18, 1828, graduated at the U. V. M. in 1847, and was admitted November term, 1851. He went West and afterwards was a lawyer in New York city. Jedd Philo Clark COTTRILL, son of Mahlon, was born in Montpelier, April 15, 1832, graduated at U. V. M, in 1852, and was admitted September term, 1854. He went to Milwaukee and became a prominent lawyer. He was one of the revisers of the Wisconsin statutes in 1878. He died in Milwaukee, in February, 1889. Milton BROWN, of Worcester, was admitted March term, 1852. He was at one time superintendent of the state prison, and did not practice. Charles Herbert JOYCE, son of Charles and Martha Eliza (GRIST) JOYCE, was born near Andover, England, January 30, 1830. The family settled in Waitsfield in 1836. Charles read with J. L. BUCK, F. V. RANDALL, and F. F. MERRILL, and was admitted September term, 1852, and at once began practice in Northfield. He was state librarian in 1853 and 1854, and state's attorney in 1856 and 1857. He was made major of the 2d Vt. Vols., June 7, 1861, and was in the battles of that famous fighting regiment till September, 1862, when he was taken sick, and not regaining his health resigned, in January, 1863, the lieutenant-colonel's commission which he had held after June 7, 1862. Col. JOYCE moved to Rutland in 1863, and representing Rutland was speaker of the House in 1870. He was a member of Congress from March 4, 1875, to March 4, 1883. He now resides in Rutland. Col. JOYCE is an impassioned speaker, and attained great popularity especially among the old soldiers, whose regard he justified by earnest and laborious work for them while in Congress. He married, February 21, 1853, Col. RANDALL's sister, Rouene M. Their children, a son and daughter, are living, the latter the wife of T. C. CRAWFORD, the well-known newspaper correspondent. Harold SPRAGUE, of Montpelier, son of Wooster SPRAGUE (who died January 15, 1883) and Nancy Stickney (YOUNG) SPRAGUE (who still lives in Montpelier and is a sister of Ammi Burnham YOUNG, the architect), was born in Montpelier, October 1, 1831, and was admitted September term, 1852. He did not practice, but went to Chicago and engaged in the commission business. He married Sarah WILSON, of Montpelier, and died in Chicago, March 15, 1885. Charles Wesley WILLARD, of Montpelier, son of Josiah and Abigail (CARPENTER) WILLARD, was born at Lyndon, June 18, 1827, graduated at Dartmouth 1851, read with PECK & COLBY, and was admitted March term, 1853. He practiced law till 1861, the first years as a partner of F. F. MERRILL; was secretary of state from 1855 to 1857, declining a reelection; was state senator in 1860 and 1861, and in 1861 became editor and proprietor of the Freeman, and so continued till 1873. He was a member of Congress from March 4, 1869, to March 4, 1875; and then, though in delicate health, resumed the practice of law. In 1878 Gov. PROCTOR (who was his classmate at Dartmouth) appointed Mr. WILLARD and Col. VEAZEY commissioners to revise the statutes. This work he engaged in till his death; the burden of it falling upon him as Col. VEAZEY was called to the bench. His old instructor, L. B. PECK, was one of the revisers of 1839, and the work of Mr. WILLARD, forty years later than that of Mr. PECK, again put our statute law in concise and coherent shape. He was an able, upright man, a good lawyer, and a statesman; a reformer and in advance of his time, he was less popular than he might have been among the politicians and materialists who haunted Washington in his day, but that is to his credit, and he had the high and deserved respect of the citizens of his state. He married, August 24, 1855, Emily Doane, daughter of H. H. REED, of Montpelier, who survived him nearly six years. Their children are Mary, Ashton R., Eliza M., and Charles W. He died June 8, 1880, at Montpelier. Ashton Rollins WILLARD, son of C. W., was born in Montpelier, April 14, 1858, graduated at Dartmouth in 1879, read with his father, in 1881 and 1882 attended Harvard Law School, and was admitted in this county, March term, 1882. He practiced in Montpelier, part of the time of the firm of HEATH & WILLARD, till July, 1887, when he moved to Boston, where he has since been in practice. He was one of the commissioners to edit the Revised Laws of 1880. Mr. WILLARD's thorough study and knowledge of the law had already given him excellent standing at our bar when he followed the example of so many other Vermonters who "seek a country." He married, September 19, 1888, Agnes, daughter of Gov. Horace and Mary E. (TAYLOR) FAIRBANKS, of St. Johnsbury. Luther NEWCOMB, the intimate personal friend of C. W. WILLARD and so long an excellent clerk of our courts, though never admitted to the bar, should here be noticed, He was the son of Dr. Luther and Lucretia (MARTIN) NEWCOMB, of Derby, and was there born, April 10, 1826. His father dying when Luther was five, the boy staid with his mother till he was eleven, when he came to Montpelier and was “brought up" by Judge I. F. REDFIELD, with whom he read law. He was clerk of the court from 1857 to his death, and had been Mr. WHEELER's deputy from 1849. He was a model officer, and a man whose friendship I am very glad to believe I had. He married, June 25, 1857, Amanda, the only daughter of Gen. Stephen THOMAS, who with their three children survives him. He died of Bright's disease, January 2, 1876. David Nelson BURNHAM, of Northfield, son of Luther S, and Lucy (NELSON) BURNHAM, and a brother of Mrs. James N. JOHNSON, was born in Orange in 1825. He read with F. V. RANDALL, and was admitted September term, 1853. He went at once to Chicago and died there in September, 1855. Nathan LORD, Jr., brother of Rev. W. H. LORD, D. D., was born at Hanover, July 17, 1831. He read law with Millard FILLMORE, at Buffalo, and with F. F. MERRILY and was admitted September term, 1854. He practiced at Cincinnati and went into the railroad business. He was colonel of the 6th Vt. Vols. from 1861 to February, 1863, when he returned to Ohio and died there a few years ago. Henry Ashley PARTRIDGE, son of Oramel and Lucy (CAPRON) PARTRIDGE, was born in Randolph, November 27, 1827. He was admitted September term, 1854, as of Waterbury. He practiced a short time in West Randolph, went to Minneapolis, went to the war, and back to Minneapolis, where he died some years after the war. He was a brilliant young man, but fell into unsteady habits. William Penn BRIGGS, an uncle of Senator EDMUNDS, was born in Adams, Mass., in 1793, settled in Richmond in 1826, continued there as lawyer, farmer, and business man, except four years in Tyler's time, when he was collector of customs, till 1854, when he moved to Montpelier, where he died September 20, 1861. He was a man of acute mind, a skillful lawyer, and of sarcastic, pithy speech. James N. JOHNSON, of Northfield, son of James W. and Lydia (HARVEY) JOHNSON, was born at Northfield, September 4, 1833. He was educated at Northfield and at South Woodstock, read law with F. V. RANDALL, and was admitted September term, 1854. He began practice in 1856 in Chicago, where he remained three Or four years and then returned to Northfield, where he has been in active practice since. He is entitled to a patent on his method of statement, but has never taken one out because no other living man could work it successfully. I shall always remember his getting away with me in the Supreme Court on a question of "contingent remainder." He has gone along steadily, getting his share of business and taking good care of it. He says: “I am a Democrat the whole length of my backbone." His backbone will never bend. He married, April 3, 1858, Eloisa, daughter of Luther S. and Lucy (NELSON) BURNHAM, of Northfield. His son Luther B. was born in 1869. George M. FISK, of Northfield, son of David and Sarah (REED) FISK, was born in Wolcott, June 7, 1830, read law with H. CARPENTER and at the Poughkeepsie Law School, and was admitted to Washington County bar in 1854. He always practiced in Northfield, represented the town in 1863, was a prominent Democrat, and a delegate to St. Louis in 1876. He had by nature a strong legal mind. He was president for some time of the Northfield Savings bank. He married Jane E., daughter of James and Annis A. NICHOLS, in 1856. He died in 1888. Ira Y. BURNHAM was a practicing attorney in Northfield in 1855 and 1856. George TUCKER, son of Samuel and Alma (RICE) TUCKER, was born at Claremont, N. H., June 16, 1825. His folks moved to Northfield, he attended Norwich University, read law at Montpelier, was admitted, is given as being an attorney in Northfield in 1856; went to Barton and became a partner of W. W. GROUT for a year before the war, when he went South as captain of Co. D, 4th Vt., resigned, lived in Alexandria, Va., and Washington City till he went to Colorado in 1880, where he died in Canon City, May 22, 1885. See Baldwin for a longer sketch. Columbus Floyd CLOUGH, Of Waterbury, son of Thaddeus and Clarissa (MORSE) CLOUGH, was born in Stowe, June 28, 1833, read law with Paul DILLINGHAM, and was admitted March term, 1856. He practiced at Waterbury till June, 1861, then in Waitsfield till October, 1867, when he returned to Waterbury, where he has since practiced. Mr. CLOUGH, though engaged in other business than the law, has always kept his share of practice and frequently appears in jury trials. He married, July 29, 1861, Persis L., daughter of Charles S. and Nancy ALLEN, of Waterbury Center. George N. DALE was born at Fairfax, February 19. 1834, and the family moved to Waitsfield that year. Hard work and poverty were the lot of his youth, but at thirty-six he was lieutenant governor of the state. He read law with DILLINGHAM & DURANT and was admitted March term, 1856. He began practice at Waitsfield, but in December, 1856, went to Guildhall, and in June, 1861, to Island Pond, where he has lived, except two or three years when his family lived for a time in Montpelier. He lived here in 1884. He has held a number of official positions, but none of them as large as the man himself. He is a born orator and withal a good lawyer. He was president of the Vermont Bar Association in 1885-86. The Governor is fortunate and happy in his family. His son Porter H. went West after attending school in Montpelier. D.S. MORSE was admitted March term, 1856. William H. BALDWIN, of Montpelier, was admitted September term, 1856. Eden SPROUT read law with J. A. WING in Plainfield and was admitted March term, 1857. Joel C. C. WINCH was born in Northfield, was admitted from there March term, 1857, and before, or soon after, beginning practice went to Texas, where he died within the last ten years. Nelson A. TAYLOR, admitted in Orange county, June term, 1857, opened an office that year in Waitsfield and went to Barre in 1859, where he remained somewhat more than a year, and then came into the firm of WING, LUND & TAYLOR in Montpelier. He was quartermaster of the 13th Vermont Regiment, and before many years went to Council Bluffs, Iowa, and went into trade. H.F. ADAMS was an attorney in Waterbury in 1857 if the Register is correct.